I am trying out this new blue font for my post today. What do you guys think? I figure it would perfectly match my mood-blue tha the Yankees' season is over. (Yes that was a terrible attempt at a joke by me.) I think the picture below of Bernie Williams hanging his head in frustration describes every feeling of Yankees players and fans around the world. So yes, I am in denial that the Yankees season is now over. I feel that it is just one of the summer months and I did not watch a game because there are still 70 or so left in the season, or they had the night off. But alas, the Yankees fell in game 5 of the American League playoffs to Los Angeles, 5-3, on Monday night. The game saw Bartolo Colon, who the Yankees had beaten the week before, pitching against Mike Mussina again. Colon, in only the second inning, became injured and the Angeles were forced to put in a 22 year old rookie, Ervin Santana, on the mound in place of him. As sad as it sounds to say, Yankees fans were happy to have one of the best pitchers in the league off of the mound and a rookie that the powerful Bronx Bombers should hit off of easily. However, after allowing two runs early on, pitched an excellent 5 1/3 innings to shut out the Yanks and help the Angels to the American League Division Championship. Mike Mussina, who had pitched well in the first game, allowed five runs on six hits. Alex Rodriguez left a runner in scoring position in the second inning, when the Yankees could have taken control in the game. In fact, the whole series A-Rod looked terrible.Many fans are blaming the Yankees' loss in the series on Rodriguez, who, after a stellar MVP candidate regular season, did not hit well in the playoffs, when they needed him the most.To be exact, he hit .133 in the series with no RBI's (runs batted in for you non baseball fans) and was 2-15. What also majorly hurt the Yankees was when Bubba Crosby, who usually does not play center field, and Gary Sheffield collided in center field in which should have been a routine catch and ended the inning. I have a picture of this collision at the top of the post. If either Crosby or Sheffield caught that ball, the inning would have been over and the game most likely would have been a different outcome. So now the Yankees return home for a long winter, watching the ALDS between Chicago White Sox and the Los Angeles Angels, or the other divisional playoff of the National League between the Houston Astros and St. Louis Cardnials. Personally, I will be rooting for the Astros because I still am a fan of Roger Clemens and Andy Pettite, who used to pitch for the Yankees. But it could also be consoling to say that if LA wins, the Yankees lost to the World Series champions. I suppose we will see! You know my feelings towards the Yankees, but I'm not going to give you a hard time about the loss. You have to admit though, their performance in the ALDS is indicative of how their season went. 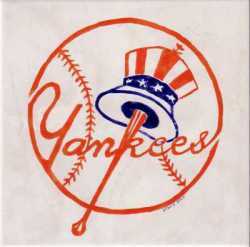 They had to battle late in the season to win the AL East; not something we usually see from the players in pinstripes. You made some very good points though in your post. For someone like A-Rod, who is most likely going to win the AL MVP and has a salary such as he does, I don't think he earned his paycheck in this post season. In the top of the 9th inning in Game 5 when Jeter led off with a single, Rodriguez killed any chance of a rally by grounding into that double play. Also, I must say I do feel badly for Bernie Williams. He is a great baseball player who I have a lot of respect for, and I feel as if he may have played his last game as a professional baseball player. As the number one homerun hitter in post season history, it will be hard for the baseball community to see him go. It seems as if this off season will be busy for the Yankees. We all know that Steinbrenner doesn't like loosing, so it will be interesting to see who stays, and who goes. Like you, I have been in state of depression for a week. I told everyone that I was close to, not to even mention the Yankees till April. Obviously I did not mean that. It’s hard to look back and try to pin point what went wrong. Not to point fingers but if you are leader and big time player you can’t just take a seat during the playoffs Cough A-Rod, Matsui Cough, Cough. Maybe my expectations were too high for the both of them, especially A-Rod at that last at bat. Your big players have to step it up no matter what, like Derek Jeter. Even the rookie came up with some big at bats, despite some errors in the field. Enough of what happened… Yankees ’06. Blue font looks cool. I'm upset that the season is over too. When Colon went out early in the game and the Young Ervin Santana came into the game as the relief pitcher naturally Yankee fans would feel they had an advantage. I do not think that this is bad sportsmanship or that thinking this way means that you are glad that Colon got injured. Mussina was pretty much a disappointment all season, which is usually what he is in the post season as well. However, in his first postseason game he did rather well and I was very impressed because I thought if we had atleast one or two good starting pitchers we would have a shot at winning the world series. I don't think its fair to blame AROD's slump on the Yankees inability to advance farther in the post season. Baseball is a team game and one man can't carry the load. At the same time one man can't be blamed for the teams outcomes. The collision in the outfield between Bubba and Sheffield was terrible. It might have been due to the inexperience the Yankees have with putting Bubba at center field. As far as I can remember he has played back up relief in right field. Regardless it was terrible to watch.